Broadly stated, stress is ever present, so continual demands are placed on the body requiring ongoing adaptation to maintain physical and chemical balance, as well as the integrative functioning of its parts. When this balance is disturbed, say, when stress is excessive or prolonged, the ability to adapt falters, fails, and, finally, pathology manifests. In principle, these diseases of stress should be reversible, as long as the metabolic disturbances underlying them are eradicated, and oxygen and nutrients are supplied thereafter. Thus, the exposure to stressors and disease can be conceived to exist on different points on the same continuum. With regard to the interest of diseases, stress isn't the issue per se; rather, it is the body's ability to adapt to the stressors that it is continuously being exposed to. Considering the nature of stressors, especially how innocuous many of them seem, and the number of stressors we encounter daily, many of the hormones that execute the stress response can tend to persist in the blood. The damages thereof are cumulative, and can, over time, diminish our ability to adapt, as we had before, leaving us more susceptible to degenerative processes associated with the stress hormones, and this begins with the excessive mobilization of free fatty acids (FFA). The regulation of FFA was first clearly elucidated in the 1950s. Around the same time, the predominant source of FFA was shown to be the adipose tissue (DOLE, 1956; GORDON & CHERKES, 1956). With these discoveries, along with the established work on the hormonal control of fuel partitioning, the road was paved for Randle and his colleagues who thereafter demonstrated a so-called glucose-fatty acid cycle (Randle, Garland, Hales, & Newsholme, 1963). Randle and his colleagues’ discovery introduced a new layer of control – a sort of nutrient-mediated fine-tuning of fuel selection. In addition to cortisol, which was the focus of Selye’s research, the other hormones that execute the stress response include adrenalin/noradrenalin, glucagon, aldosterone, growth hormone, thyroxin, and ADH.1 These hormones stimulate the mobilization of fatty acids, and thus raise blood FFA concentrations. In diabetes (and old age and obesity), there is a tendency for blood FFA concentrations to rise. Cortisol also interferes with the conversion of T4 to T3. T4 has a permissive effect on adrenalin, and without it, adrenalin could not exert its actions on tissues (e.g., lipolysis). Adrenalin, in turn, inhibits insulin secretion and stimulates the HPA axis, further reinforcing the inhibition in the conversion of T4 to T3. What is more, an increase in the activity of the sympathetic nervous system, and the persistence of excessive concentrations of adrenalin, noradrenalin, and cortisol in the blood are prominent risk factors for cardiovascular disease—of which diabetics, on average, have at least a 2- to 4-fold increase in risk of as compared to non-diabetics. Interestingly, strong or unrelenting stress weakens cortisol’s effectiveness in executing a negative feedback loop at the hypothalamus, and as a result, cortisol’s feedback loop functions from a higher set point, lowering the threshold above which pathology could set in. In diabetes,5 obesity,6 and old age,7 concentrations and production rates of cortisol are increased. Like cortisol, the other previously mentioned stress hormones, by activating the stress metabolism, lead to degenerative changes in the body. At its core, the stress metabolism entails the oxidation of fat in preference to glucose, and the impairment in the ability to switch from one fuel source (fat) to another (carbohydrate [like after meals]).8 Thus, the stress metabolism implies a high rate of fatty acid oxidation, which is an energetically inefficient process; a high rate of fatty acid oxidation also leaves us susceptible to ectopic fat deposition9 and insulin resistance (through the accumulation of incompletely oxidized lipids inside cells, and then degradation of the insulin receptor). On stimulation, fatty acids, namely polyunsaturated fatty acids, can decompose—especially against high glucose concentrations—to generate reactive aldehyde fragments that can form Schiff bases with the amino groups on proteins and lipids inside and on the surface of cells. This is the initial step in the formation of AGE. Also, fatty acids, by inhibiting PDH, permit the accumulation of triose phosphates (dihydroxyacetone phosphate and glyceraldehyde 3-phosphate) from sugars, resulting in insulin resistance and generating reactive aldehydes that can glycate proteins (and other lipids [initiating lipid peroxidation processes]) inside cells. Although obesity is highly predictive of diabetes—an observation that was first made known in the 1960s—it is not conditionally required for it. Instead, the pattern of fat accumulation is a greater determinant of diabetes, because visceral fat is pathogenic, whereas subcutaneous fat, per se, is not. That is, on the depletion of visceral fat, by weight loss or surgery, the secretion of inflammatory peptides (e.g., angiotensinogen, leptin, TNF-α, and IL-6) decreases dramatically from the subcutaneous fat cells. Due to its density of β3 receptors, low density of insulin receptors, and direct access to the liver via the portal vein, upon stimulation, fatty acids are shuttled from visceral fat to the liver, initiating all the degenerative effects therein associated with the stress metabolism, as described above. In summary, because the chronic stressors of a lifetime cause feedback loops to function from a higher set point, the stress hormones tend to persist in the blood for longer and at higher concentrations. Fat is increasingly oxidized in preference to glucose as a result, and the rising glucose concentrations can, via oxidative stress, initiate lipid peroxidation processes that, in turn, damage mitochondrial respiratory complexes involved in oxidative metabolism. In essence, diabetes can be regarded as a condition of unrelenting stress (like the kind Selye subjected his rats to) of which visceral adiposity, promoted by cortisol (and antagonized by progesterone), aggravates. Because he could, Selye carried out his experiments to where there was a progressive loss in adaptation, exhaustion, and breakdown of homeostatic mechanisms. These consequences are preceded by degenerative changes, namely the disorganization of cell cytoplasm, cell swelling, lipid accumulation in cells, and damage to mitochondrial respiratory complexes. The ability to continuously produce energy, as well as the provision of support for the dysregulated pattern of secretion of the stress hormones, however, short-circuits the progression of these degenerative changes and failure to adapt. In conclusion, the common perception of diabetes—that it is a disease of too much sugar in the blood—misses the mark in a big way. Cortisol, itself, for example, can rapidly raise blood glucose concentrations by increasing the rate of gluconeogenesis in the liver, and by inhibiting the use of glucose by cells in the body. Cortisol also has a permissive effect on adrenalin and glucagon, both of which also raise glucose concentrations. Hyperglycemia instead should be conceived as our resistance to stress, and as such pharmacologically forcing blood glucose concentrations down is misguided, and, in effect, putting the cart before the horse. 1. Lager, I. The insulin-antagonistic effect of the counterregulatory hormones. Journal of internal medicine. Supplement 735, 41–7 (1991). 2. 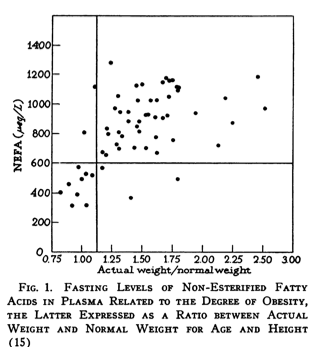 Dole, V. P. A relation between non-esterified fatty acids in plasma and the metabolism of glucose. The Journal of clinical investigation 35, 150–4 (1956). 3. Hoen, S. et al. Hydrocortisone increases the sensitivity to alpha1-adrenoceptor stimulation in humans following hemorrhagic shock. Critical care medicine 33, 2737–43 (2005). 4. Ward, K. D. et al. Influence of insulin, sympathetic nervous system activity, and obesity on blood pressure: the Normative Aging Study. Journal of hypertension 14, 301–8 (1996). 5. Alberti, L. et al. Type 2 diabetes and metabolic syndrome are associated with increased expression of 11beta-hydroxysteroid dehydrogenase 1 in obese subjects. International journal of obesity (2005) 31, 1826–31 (2007). 6. Sims, E. A. & Horton, E. S. Endocrine and metabolic adaptation to obesity and starvation. The American journal of clinical nutrition 21, 1455–70 (1968). 7. Deuschle, M., Weber, B., Colla, M., Depner, M. & Heuser, I. Effects of major depression, aging and gender upon calculated diurnal free plasma cortisol concentrations: a re-evaluation study. Stress (Amsterdam, Netherlands) 2, 281–7 (1998). 8. Heather, L. C. & Clarke, K. Metabolism, hypoxia and the diabetic heart. Journal of molecular and cellular cardiology 50, 598–605 (2011). 9. Chavez-Tapia, N. C., Rosso, N. & Tiribelli, C. Effect of intracellular lipid accumulation in a new model of non-alcoholic fatty liver disease. BMC gastroenterology 12, 20 (2012). 10. Fu, M. X. et al. The advanced glycation end product, Nepsilon-(carboxymethyl)lysine, is a product of both lipid peroxidation and glycoxidation reactions. The Journal of biological chemistry 271, 9982–6 (1996).